The contract runs through 2022 with a two- year base period and three one- year options and provides program and technical support to NOAA’s satellite and observation missions. 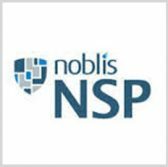 Noblis will support the design, development, testing, and operation of satellite systems, in alignment with National Environment Satellite, Data, and Information Service program initiatives. The company will also apply data management and data analytics expertise to the program, to help NOAA develop predictive information and timely access to global environmental data from satellites.